Someone recently wanted me to state that "peace" was my goal. It isn't. 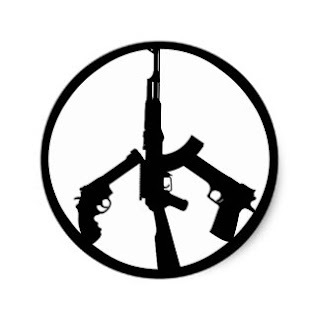 Sure, peace can be nice, but liberty is better. After all, no one is more peaceful than a corpse. Bad guys who want to violate you without risk to themselves want you to be peaceful. They want you to go along to get along, and let them do what they do. They don't want you to fight back or defend yourself from them. Peace always depends on what someone else is doing. No matter how compliant you are, there's no peace if you are being violated. So, peace isn't really up to you. You can, however, choose liberty. Exercising it won't guarantee peace, in fact, in this Era of Authority, it will pretty much guarantee the opposite. That's not your fault. You can't let the bad guys set the tone for your life. So, yeah, peace is OK as long as you don't sacrifice yourself on its altar. It isn't worth it.